The UK and six other nations are launching a fresh effort to intercept drug smuggling runs across the Atlantic into Europe from Latin America. A special centre is being opened in Portugal to co-ordinate rapid response naval operations against the trade. A senior officer from Britain's Serious Organised Crime Agency (Soca) has been named the operation's first director. Ministers hope the special naval operations centre will mean less cocaine reaches British drugs markets. Officials say the amount of cocaine being smuggled into Europe has been rising - but the Lisbon-based Maritime Analysis and Operations Centre - Narcotics (MAOC-N) has been set up for a new concerted continental effort against Latin America-based producers. 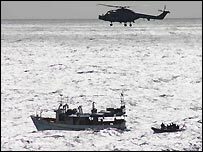 The operations centre co-ordinates drug smuggling intelligence and vessels from each country's navy which are patrolling waters between South Africa and the Norwegian Sea. Officers at the centre take decisions on which vessels from the partner nations are best placed to intercept a suspected cocaine shipment. The centre is jointly run by the UK, Portugal, Spain, the Irish Republic, France, the Netherlands and Italy but will also include US military officers linked to naval operations in the Caribbean. While the operation is being officially launched on Sunday, its officers have already run 22 operations since April, leading to 10 seizures totalling more than 10 tonnes, say officials. In June intelligence gathered by British officials led to the French Navy intercepting a Brazilian vessel carrying 840kg of cocaine. Home Office minister Vernon Coaker said: "Our law enforcement agencies are focusing efforts on reducing the supply of Class A drugs, which cause the most harm to the individual, communities and society as a whole. 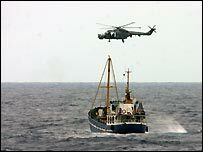 "Soca involvement in the Maritime Analysis Operations Centre - Narcotics will help target cocaine smugglers by sharing intelligence with other countries and coordinating rapid air and sea operations, making the best use of law enforcement and military resources to stop attempted drug runs across the Atlantic. "By taking an active role in this innovative drug trafficking centre we are cutting down the pathways used by those serious criminals attempting to infest our country with cocaine." Despite increasing collaboration between European agencies, the amount of cocaine reaching Europe from Latin America has increased over the past decade. The centre is seeking to attack that trend by targeting private vessels used to avoid detection by customs officials at ports. Launched in 2006, Soca says that in its first year it seized one fifth of Europe's cocaine supply - 73 tonnes with a street value of £3bn. While critics say the agency needs to be more transparent, its chiefs say it needs to be judged over the long-term. Its strategy focuses on bringing down organised criminals by trying to make it impossible for them to do business, rather than focusing on just making arrests.